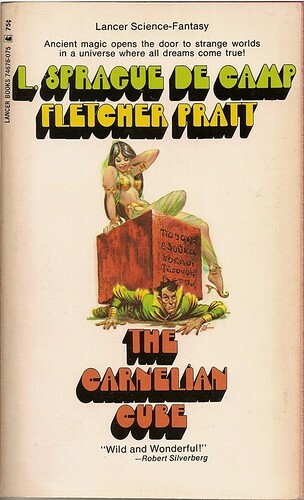 The Carnelian Cube, by L. Sprague de Camp and Fletcher Pratt, is one of a handful of 1970s and earlier fantasy cited by Gary Gygax as significant influences upon the Advanced Dungeons & Dragons roleplaying game in Appendix N of his opus, the Dungeon Master’s Guide. As D&D was a primary vector from which fantasy first entered my life and captured my imagination, I’ve always been especially enchanted with the books on this list. I’ve been seeking them out and reading them for years, and each one I cross off the list is a milestone in my reading history. I launched the Planet Stories fiction line at least in part thanks to my fascination with the pulp fantasy on Gygax’s list. I came to The Carnelian Cube a few months ago with an open mind. I respect de Camp’s efforts as one of sword & sorcery’s pioneering paperback editors, but his dripping-with-disdain biography of Lovecraft and his less than up to the challenge Conan the Barbarian pastiches have always left a sour taste in my mouth. I eagerly await the de Camp novel that demands I raise my expectations, but it hasn’t happened yet. Pratt is a tabula rasa for me. He famously collaborated with de Camp on the “Incompleat Enchanter” series (also on Gygax’s list), which I haven’t read. His The Blue Star appeared in Lin Carter’s hugely influential Adult Fantasy imprint from Ballantine in 1969, a part of the bedrock of modern fantasy. But again, I haven’t read it, so other than respecting both of these authors as early pioneers, I went in pretty blind. The Carnelian Cube first appeared in a 1954 Gnome Press hardcover, which is about as strong bona fides as you can get for early book-form sci-fi. My copy is a 1970 reprint of the ’67 Lancer books edition, with a cover by Frank Kelly Freas, one of the genre’s most higly respected artists. The book concerns a small cube of carnelian inscribed with mystical writing in ancient Etruscan. When the archeologist Arthur Cleveland Finch sleeps with the stone under his pillow, its magic transports him to the world of his desires, in the first case “a perfectly rational world.” He awakens a resident of that world, with many details of world history and culture shifted to match his desires. Unfortunately, the cube is nowhere to be seen, and Finch must navigate the strange social landscape of a plantation called Strawberry House to discover it and eventually escape from an increasingly absurd and deadly escalation of tension that must surely end in his death. In Strawberry House he becomes Finch Arthur Poet, a man of art in a strictly regimented world. After falling afoul of the law for charges of advertising and indolence, Finch reclaims the carnelian cube and dreams of a world where and individual can be himself. Thing brings Finch to another version of pastoral Tennessee, this time dominated by an almost completely functionless society of violent nonconformists. When Finch confusedly offers his “Finch Arthur Poet” name from the previous reality, he gets pulled into the dangerous machinations of the Pegasus Literary Society, rife with psychics and murderers. He finds work as the coxwain of a tumultuous rowing crew, attempts to avoid the temptations of a beautiful woman, and realizes that a little conformity is necessary for survival. This is the lushest of the three realities presented in the book, with memorable names (and characters) like the bombastic Hyperion Weems, the temptress Eulalie, the native american ghost-spirit Ganowoges, and an effective sense of growing, dangerous chaos. Finch finds the cube and drifts off to sleep thinking of his home in the very first chapter, and of the digs of ancient Etruscan sites. He awakens into a world in which scientists brainwash thousands of subjects into thinking they are ancient warriors, setting them in bloody wars against once another to simulate important moments of ancient history. In the end Arthur Finch escapes this cold, immoral world of cold social science to escape to who knows where, and the cycle continues. Perhaps because it covers three distinct realities, and perhaps because it was written by two authors, The Carnelian Cube is often disjointed and difficult to follow. I went in expecting heroic fantasy but ended up with something written much more like a less-funny Vonnegut book, part whimsy and magic and part literary and serious-minded. I found some of the broad racial stereotypes (particularly the aforementioned Indian) in the book more difficult to excuse as a product of their time than in 1930s offerings from authors like Merritt or Otis Adelbert Kline, and I guess in the end I didn’t think all that much of the book as a whole. As for what it really brought to D&D, it’s pretty easy to say. The different realities of The Carnelian Cube are akin to pocket dimensions or demi-planes in D&D parlance, and the cube itself literally appears as one of the game’s most powerful magic items. Dust off your old hardcovers and look up the cubic gate, and you’ll find that it’s described as being made of, you guessed it, carnelian. « Paperback Flash Warming Up for Relaunch! While I can understand that de Camp may not be for everyone, I have been devouring his books lately and really enjoy them. For me he captures the right combination of fantasy, action and humor that I think of with old school D&D. I also like that his “heroes” are always just average joes who manage to figure out how to succeed under trying circumstances (again, pure old school D&D). Best books I’ve read so far: The Goblin Tower, The Hand of Zei, The Tritonian Ring. Awesome! I have all of those and I look forward to reading them. Thanks for taking the time to comment on my blog! If only more than 76 people would read about this!